So, yes, even though I did like the plane very much, I got off of it after it landed in Salt Lake City last Wednesday night. Mr. Karen and I claimed our bags and caught a van up Little Cottonwood Canyon. It was raining in the valley but that turned into snow as we climbed up the canyon. When the van stopped to drop us off at Snowpine, I stepped out into white stuff to the top of my hiking boots, and it was still snowing. Yay. We thought we might see our friend Hank and his stepson Harry when we got there–they’d flown in the day before–but it was a little late and they were already in bed, so we just went and got settled into our room. One of the fun things about Snowpine is every room is a little bit different. This time we got shelves and a sloping floor with twin beds built up one end to compensate. The last time we got a dresser and bunk beds. Every room I’ve ever stayed in there has had at least six corners, too. The place has character. Thursday we woke up to all that fresh powder that had fallen the night before. Even though the time difference should have been working in my favor, I was so tired that I put my underwear on backwards and didn’t even notice until a mid-morning bathroom break. 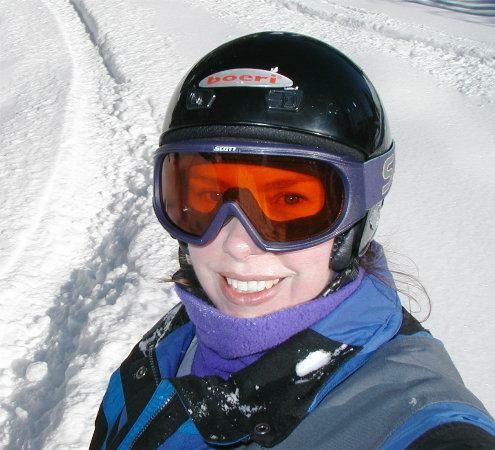 I just left it–I didn’t want to take off my ski boots, my bibs, and two pair of long underwear pants just to get the label on my underwear in the right place. 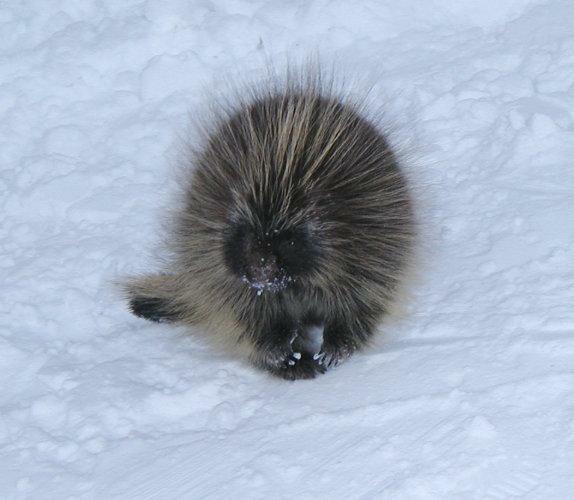 So what if it was a little bunchy; that didn’t keep me from skiing. I even did a couple black diamond runs I hadn’t tried before. 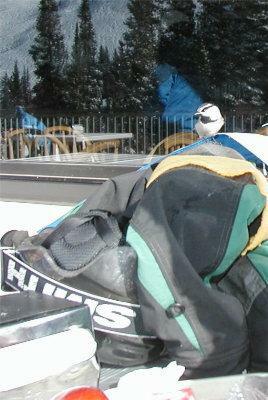 It was warm enough to eat lunch outside, where we made the acquaintance of a little bird we named “Gary”. A soak in the outdoor hot tub and dinner rounded out the day nicely. Friday I got my underwear on right way round and skied a couple more black runs that were new to me, including one that has to be hiked into. As hikes go, this is a very short one, but it still sapped my energy. I blame the altitude. Even though we didn’t have any fresh snow, the stuff that was on the ground had held up so well that we wore our powder skis again. 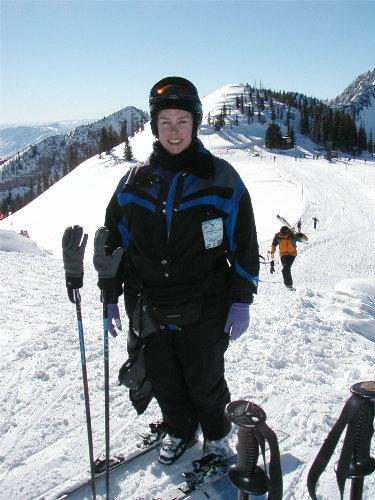 (Well, Harry didn’t have powder skis, but his rentals were the newer all-mountain kind so he kept up just fine. Being 12 and flexible and unafraid to fall helped him, too, I’m sure.) It was pretty warm, and some areas got a bit grabby by late afternoon, like the spot we started calling the dog trees because several years ago there was a dog who’d be out on the deck of a house near the entrance to the run. Saturday there was no fresh snow, so we put on our regular skis. Hank and Mr. Karen soon decided they would rather go back to their powder boards and stay in the trees and ungroomed spaces, but I kept my pointy ones on and spent most of the day by myself. Making turns down the groomed runs, I found my happy zone, where my brain starts singing. Unfortunately, all morning all it wanted to sing was Tears for Fears’ “Head Over Heels”, which got a little annoying. 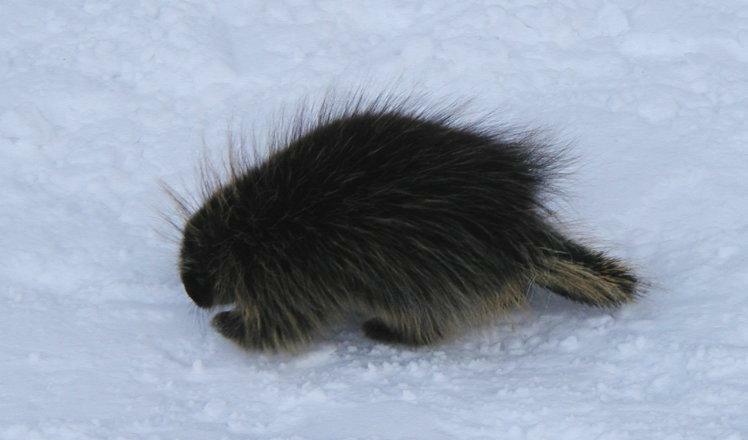 One of the highlights of the day was seeing a young porcupine hanging out near the restaurant. The four of us saw him at lunch, but he was still around when I stopped for a break mid-afternoon and fewer people were around. I stood really quietly and he came over and sniffed at the tip of my ski before ambling off. It was very cool to see. Sunday it snowed and snowed and snowed, so it was back to the powder skis. I had a last lunch at Alf’s, where the staff has a sense of humor. The road out was closed for a while in the afternoon for avalanche control; Hank and Harry had to leave before dinner to make their flight home, but the road was open by then. Mr. Karen and I took a last soak in the hot tub, snowflakes piling up on our heads. At dinner, everyone seemed to be talking about when the road would close again and how long it would stay that way and whether we’d be locked into the lodge in the morning. Since we had a 7:45 pickup scheduled with the van company, it was all rather anxiety-provoking. I really didn’t want to hassle with trying to get packed up and out that night and find a place to stay near the airport, but didn’t know when we could get another flight out if we missed ours in the morning. By the time we called the shuttle company, it was too late to leave–the road was closing earlier than predicted and there was no way we could be ready to go as fast as we’d need to get the last van out. We’d just have to stay put and hope we could get out in the morning. Interlodge started at 1 a.m.; when it would end, no one knew. Early Monday, Mr. Karen called the shuttle company and got the bad news that they weren’t expecting the road to open until late morning, which meant we would miss our flight. Then he called the airline and found that the only seats left that day were on an 11:45 p.m. connecting through Atlanta with a three-hour layover. Crap. I called Northwest and they had no seats at all. Crappity crap. We went up to breakfast rather discouraged, only to have the gift shop manager (who we’d talked to the night before) call out to us that the road was open and interlodge was lifted. Mr. Karen called the shuttle company back; they hadn’t heard about the road being open and weren’t sure when they could get a van up to us. Well, okay, then. We put our luggage up by the front door in a show of faith and went back into the dining room for breakfast. Amazingly, we were about five bites into our French toast when a driver showed up. He’d happened to be down at the base of the canyon when the road opened and just headed up. Too cool. We left our plates and loaded into the van and three other pickups later, we were on the way to the airport. The traffic coming up the canyon was just crawling–everybody wanted to get to all that powder–so it’s a good thing our driver came up when he did. We ended up getting to the airport in plenty of time for our flight out. All that worry for nothing. Things have improved since the last time I flew through Salt Lake. The TSA baggage screen is still separate from the airline check-in, but it’s done after instead of before, which means one doesn’t have to wait until the TSA is done to get a boarding pass. The security screening is better, too, as they’ve switched to the one big line approach. Despite the drama about getting home, it was an excellent trip. Being at Snowpine is so relaxing. I don’t have to drive anywhere. I don’t have to put on real shoes. I don’t have to tax my brain with choosing off a dinner menu, or even choosing a restaurant. 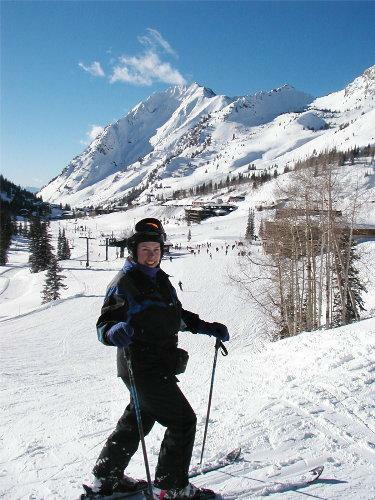 And Alta is a great place to ski. Not so much to shop or bar hop, but that’s not what I go to the mountains for. I came home feeling like I’d been away a long time and it hadn’t even been a week.